The Galaxy A5 (2016) is the first non-flagship Galaxy phone to receive Nougat; the rollout started with Russia, and it has now expanded to the Indian market. It could be available in other markets already, so if you have received the update on your A5 (2016), do let us know in the comments section. With Samsung aiming for consistency in software across its range of devices, the Nougat update for the A series devices brings the new user interface that runs on the Galaxy S7 and Galaxy S7 edge. Performance and battery life should get a boost, and we will be taking a closer look at what the latest version of Android brings to the Galaxy A lineup in the near future. For now, check out the video below that shows Nougat in action on the Galaxy A5 (2016). If you’re in India, go into the Settings » About Device menu to download Nougat. Don’t see it yet? It can take time for updates to reach everyone, so be sure to keep checking from time to time. Update: The update is also rolling out for the Galaxy A7 (2016) (as a 970 MB download) in India, as pointed out to us by Navin. We’ve added more screenshots. Samsung Galaxy A7 710FD 2016 update de hi nhi raha hai lolipop hi hai naughat ka update de hi nhi raha hai kaise kre sir update pls help me. 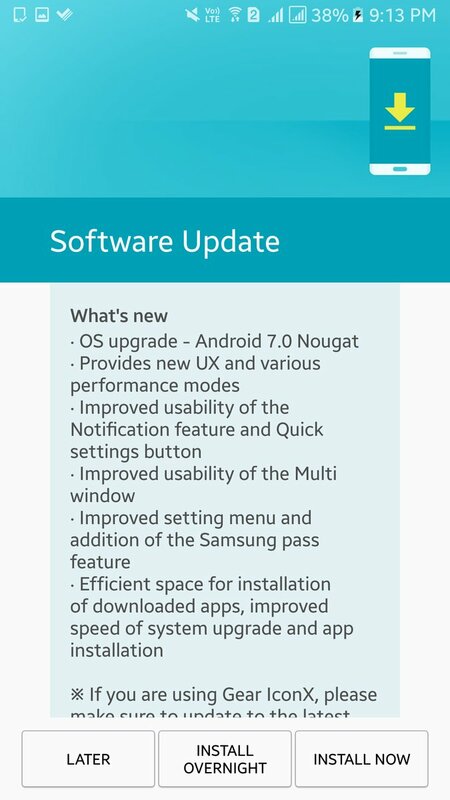 All A7 2016 has nougat..only SM-A710Y hasn’t received Nougat update..is it available for this model? ?or can use others firwmare to flash? My phone name Samsung galaxy a5 2016 . But my question When will you come to Bangladesh. SM-A310F update naugat in indonesia. Which one of ROM? It isn’t working for me. No updates. SM-A510F just got the nougat update in Bulgaria. My SM-A510M PANAMA got the update today, very pleased!!! The only problem is that the NOUGAT update did not get the always on display! Samsung should give Nougat for all new flagship even 2015 releases..why should have 3 verse of a5..a7 if the function still same.. Still there is no any update of nougat in Nepal.why? when will update coming for SM-A510FD Nepal? When will A5 2016 (SM-A510F) get the nougat update in Bulgaria? 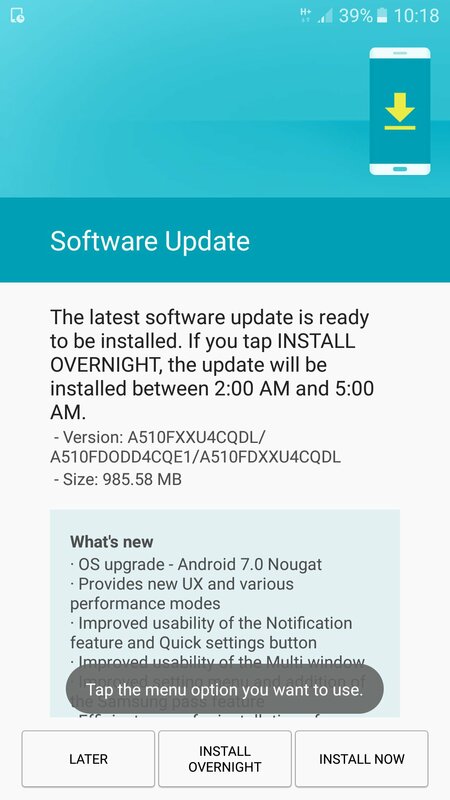 In Chile (CL) is rolling up the update Nougat 7.0. Now i update the phone (SM-A710M) and its much more rapidly and stable. Thanks for the update. Amigo, no sabes si la actualización llegó para el A510M de Chile? Gracias! Could anyone updated A5(6) to Nougat see any improvements in the camera, especially, the front camera? Any new modes added? Can anyone confirm camera improvements? Or else, I have to wait until Rovo releases Xposed Framework for Nougat. I have updated A7 (2016) to Nougat. I am facing issue with 4G & 3G. Suddenly mobile is disconnected with internet though it shows that it is connected with network. Can anyone help me with that.